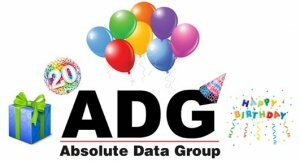 It’s Absolute Data Group (ADG)’s 20th Birthday! 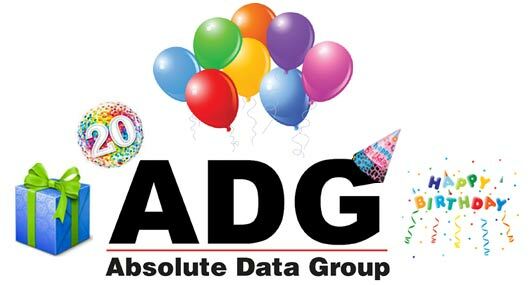 As 2017 draws to a close and ADG reaches its 20th Birthday milestone on the 4th of November, I wanted to reflect on why the team at ADG are so dedicated in what we deliver to our customers every day. Although I won’t say it feels like yesterday that I started my company, I will say that the last 20 years have indeed flown by. Over the years I’ve been fortunate to work with an amazing and talented team of people, most of which have been with me for over 10 years! Without these committed individuals, ADG simply could not build, sell and support the high tech applications that we do today. Having been in business for 20 years I’ve seen technologies change and companies rise and fall in my industry. Every day in the private sector, new challenges and opportunities arise and what I can say with confidence is that I still love what I do. I enjoy helping our customers achieve their goals daily, whether it is training them in topics we are specialists in, assisting them with our consulting skills or implementing our R4i software that we built locally here in Brisbane, Australia! I love that as a team we have the opportunity to bring new products and features to market that saves our customer’s time, enhances their deliverables and makes them more competitive to their end customers. Being a part of every customer’s delivery makes us very proud of what we have achieved, and makes our team feel the effort we put in daily is all worth it. Coming from a four generation tri-service family and having served in the Military myself, I am now proud to watch my son as he prepares to join the Military as a fifth generation. ADG’s commitment to ensure every war fighter in the field has access to the right information as quickly and as easily as possible, is a goal we will continue to deliver. As we move forward over the next 12 months, you will see further changes coming as the team transition to one company inside OneStrand LLC. Part of this transition will be the new face of the R4i software logos. A modern facelift for our extremely modern and leading-edge technology. Reflecting on ADG, as a business which started life consulting in the technical authoring and publishing space, the evolution to where we are today has been a winding and fun-filled journey. I along with the rest of the team at ADG and our extended global family the OneStrand Team, look forward to supporting our Aviation, Land, Sea and Space programs for another 20 years. Thank you to my team who have supported me in making ADG the company it is today, and thank you to all of our loyal customers who have trusted in us to support you.